You, Me and Movies: "Shin Godzilla" is the only disaster Resurgence you should be interested in. "Shin Godzilla" is the only disaster Resurgence you should be interested in. When I was growing up, some of my first, fond memories of movie watching were the old school "Godzilla" movies. I watched the movies where Godzilla was a "villain." I watched the movies where Godzilla battled other monsters. I have always had a fondness for the character for as long as I could remember. I was in third grade when the 1998 "Godzilla" movie came out. The one with Matthew Broderick, it took place in New York, it had a Roger Ebert parody, you know the movie. I may have liked it as a kid, but as I grew older, it just didn't hold up. Thankfully, I did enjoy the 2014 Gareth Evans film that came out a few years ago. For fans of the old school Godzilla movies, "Shin Godzilla," (aka Godzilla Resurgence) is for you. A classic style Godzilla movie where the city of Tokyo, Japan is threatened by the popular kaiju. 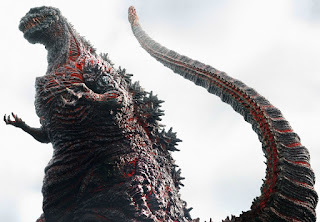 Yes, Godzilla looks very reminiscent of his past days, but with today's editing and some minor special effects work gives this film a updated look but still keeping in the spirit of the films that came before. The story itself is simple. Something awakens a monster under the seas of Japan, it gets to the surface to wreak havoc. It evolves from form to form, becoming more powerful and larger as he evolves. The third form of Godzilla in particular, crawling and wide-eyed, is particularly haunting. The government of Japan and representatives from around the world get together to destroy the monster. That's essentially the plot. Sadly, there are not cool monster versus monster battles in this movie. Just a classic man versus nature tale. What struck me is the movie is surprisingly scientific. This isn't a film whose climax is a simple matter of punching Godzilla hard enough until he dies. The team in charge of bringing the monster down gets into the nitty-gritty of the safest way to save the world. The attention to detail and character development is mesmerizing. The Japanese ensemble all do good work and I am glad that this monster put its script first, instead of being a mere eye-candy, joy ride. Godzilla himself has a few modifications. He has his typical fire breathe. But he also can shoot purple energy beams out of the spikes on his back. Didn't remember that from any of the old movies. If you are a fan of the classic Godzilla movies, "Shin Godzilla" will no doubt be for you. This is a fun update on a lost subgenres of movies. If you don't like subtitles, I would warn you off this too. This is an authentic film with no horrid dubbing over words. There are some parts with English, feeling kind of Quentin Tarantinian in style. Overall, I enjoyed this return to form.